The second experiment took place in St. Petersburg, FL. Participants consisted of drivers traveling past two sites. The first site is on 58th Street N south of 3d Avenue. The site traverses four lanes and has a posted speed limit of 35 mi/h and an ADT of 19,192. It also has a median island and provides a crossing for residents of a nearby retirement center. There is also a pedestrian-activated standard overhead incandescent yellow flashing beacon at this site. The second site is at 4th Street S and 18th Avenue. It is equipped with a side-mounted, pedestrian-activated, standard overhead incandescent yellow flashing beacon system. This roadway traverses four lanes and has a posted speed of 35 mi/h and an ADT of 9,600. The treatment in this experiment was the standard overhead yellow flashing beacon (see figure 4) and a standard side-mounted yellow beacon. These systems are activated when the pedestrian call button is pressed. The system has two 12-inch-diameter yellow beacons facing both directions of traffic. The beacons flash 55 times per minute, and the illumination period of the beacon is 50 percent of the time. The comparison of the first site with a standard overhead beacon with the RRFB system was carried out at the 58th Street N south of 3d Avenue site. Following the baseline, the standard overhead beacon was introduced, followed by the RRFB system. First, only the two curbside beacons were activated, and then all four beacons were activated (curbside plus median beacons). Five baseline datasheets were collected in the absence of activation of the standard system. The system was activated during treatment, and 7 datasheets, each comprised of 20 crossings, were collected. 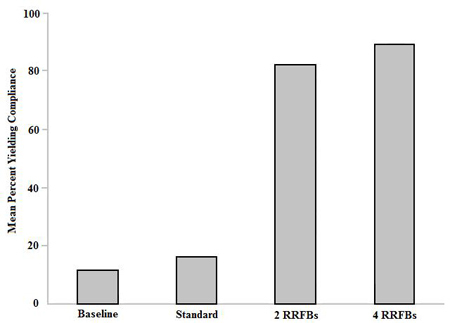 Following the standard beacon treatment, two RRFBs were implemented, followed by the four-beacon system. Each rapid-flash treatment was observed for 5 datasheets each, creating a total of 680 crossings. Figure 4. Photo. Northbound view of standard overhead beacon system and crosswalk at 58th Street N with advance yield markings. At the second site (4th Street S and 18th Avenue), the standard side-mounted incandescent beacon system was compared to the RRFB system. The baseline consisted of 46 crossings. After the baseline, a side-mounted standard beacon system was evaluated for 70 crossings at 7- and 30-day intervals. 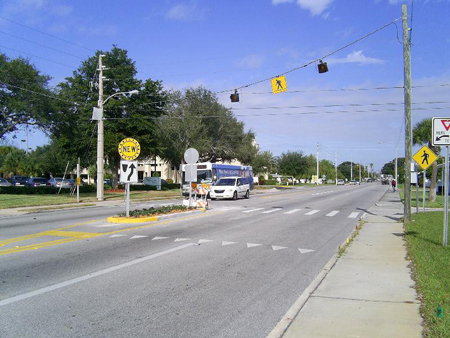 Next, a two-beacon RRFB system was installed and evaluated for 70 crossings at 7- and 30-day intervals. All crossings at this site were staged. For the first site at 58th Street N, a z-test for proportions was performed. The difference in driver yielding behavior between the baseline and the standard overhead beacon was not significant at the 0.01 level (z = 1.06 with 85.5 percent confidence level). The difference in driver yielding behavior between the baseline and the two-beacon system was significant at the 0.01 level (z = 12.75 with 100 percent confidence level). The difference in yielding behavior between the baseline and the four-beacon system was also significant at the 0.01 level (100 percent confidence interval), and the difference between the two- and four-beacon system was significant at the 0.01 level (z = 1.85 with 96.8 percent confidence level). The difference in the proportion of drivers yielding less than 30 ft before the crosswalk was significantly greater at the 0.01 level for the standard beacon condition than the baseline condition (z = -2.70 with 99.7 percent confidence level). There were no significant results reported for evasive actions such as pedestrian/vehicle, pedestrian trapped in median, or car behind a yielding car or drivers slamming on brakes (inadequate number of occurrences of these events to perform the tests). For the second site at 4th Street S, a z-test for proportions was performed. The difference in driver yielding behavior between the baseline and the standard side-mounted beacon was significant at the 0.01 level (z = 6.03 with 100 percent confidence level). The difference in driver yielding behavior between the standard side-mounted beacon and the two-beacon RRFB was significant at the 0.01 level (z = 11.58 with 100 percent confidence level). The difference in proportions of drivers yielding more than 30 ft between the standard side-mounted beacon and the RRFB was significant at the 0.01 level (z = 4.65 with 100 percent confidence level). No test was performed between the baseline and either condition because no vehicle yielded during the baseline condition. The level of conflicts observed at this site was not sufficient to perform a statistical analysis at this site. It should be noted that the low level of conflicts was likely a result of the research assistant consistently using the safe crossing procedure during crossing. This effect was most marked during the baseline condition when driver yielding was low. The average yielding compliance at the first site at 58th Street N Avenue during the baseline recording was 11 percent. The activation of the overhead standard beacon produced an average yielding percentage of 16 percent—an increase of 5 percentage points above the baseline. The introduction of a two-beacon RRFB system produced an increase in yielding compliance to 78 percent. A four-beacon RRFB system was associated with 88 percent yielding compliance. Reversal back to the two-beacon system produced a yielding compliance of 85 percent followed by 89 percent yielding compliance for the second four-beacon system treatment. The average yielding compliance for a two-beacon system was 82 percent. The average yielding compliance for the four-beacon system was 89 percent. The introduction of a two- and four-beacon system produced 71 and 78 percentage point increases over the baseline and increases of 66 and 73 percentage points over the standard-beacon system, respectively (see figure 5). Baseline data from the second site at 4th Street and 18th Avenue showed zero percent yielding compliance. Activating the side-mounted standard beacon produced a yielding compliance of 15 percent after 30 days. The RRFB system produced a yielding compliance of 87 percent after 30 days. 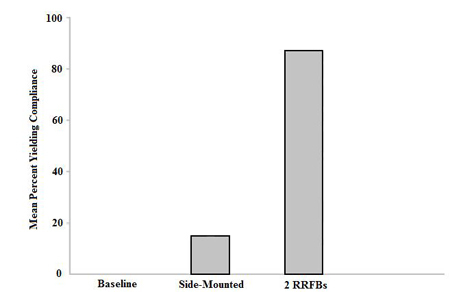 The RRFB percentages are representative of a two-beacon system only (see figure 6). Figure 5. Graph. Driver yielding behavior at the 58th Street N site. Figure 6. Graph. Relative efficacy of the side-mounted yellow beacon at the 4th Street S site. The yielding distance improved in the absence of the standard flashing beacon than in its presence. When the standard flashing beacons were activated, a higher percentage (1 percent) of drivers yielded at less than 30 ft. However, there were more drivers yielding during treatment, and this produced a larger number of drivers who yielded at a closer distance than in the absence of the light. There were 48 drivers who yielded at less than 30 ft during the treatment compared with only 27 drivers who yielded during the baseline condition. In addition, 5.6 percent of drivers yielded at more than 100 ft during treatment as opposed to 8.4 percent who yielded at more than 100 ft during the baseline. The majority of yielding during both conditions occurred between 30 and 50 ft. During the baseline, 41 percent of drivers yielded at this distance, and 43 percent yielded during the standard beacon treatment. The majority of driver yielding when the RRFB was activated occurred between 30 and 50 ft (44 percent). During the four-beacon system, the majority of driver yielding was also between 30 and 50 ft (42 percent). The percentage of drivers who yielded at more than 100 ft more than doubled from the two-beacon system to the four-beacon system, with an increase from 6 to 12 percent. Interobserver agreement on the occurrence of a yielding behavior averaged 92 percent with a range of 80 to 98 percent, averaged 100 percent on drivers who slammed on the brakes, and averaged 99 percent on stopping distance.